Both ways use the DHXScheduler.ToPDF() method to invoke the export. The method enables scheduler serialization and passes serialized data to a handler (online service, controller action) for generating a PDF document. url - (string) the url to the action implementing the export or online service that will generate a PDF file. There is a possibility to export into a document several view pages at once. For this purpose you should use the DHXScheduler.ToPDFRange() method. 2) In the View you should call the toICal() method. To get data in the iCal format directly from the DB, you should use the DHTMLX.Scheduler.Data.ICalRenderer class, particularly the method string ICalRenderer.ToICal(). 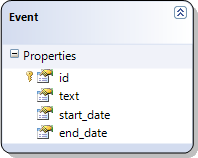 The built-in serializer exports only 3 data properties: start_date, end_date and text. If you want to export some other data properties or change serializing of the 3 mentioned properties - 'renderer' comes in handy. If you store data in properties with some other names you can specify new values for those properties. See the client-side documentation for more details.